Next year is expected to see an unprecedented rush into so-called DIY investing. Below we explain why you may feel the compulsion to manage your long-term savings more directly, by shifting them to a low-cost investment shop that allows you to pick your own funds. But before you take the plunge, it’s essential that you digest this chart – it could save you as much as £14,000 over 20 years. In short, the graph shows how the costs applied by the investment shop, which may be modest at the start, rapidly build up over decades. This is how it works. You hand £10,000 to an investment shop and tell it you want to buy a certain fund. That fund will have a charge, typically 0.75 per cent or £75 a year.But the investment shop needs to levy its own charge, too. There are three common ways that these charges are applied. The biggest brokers levy percentage fees. Hargreaves Lansdown charges most of its investors 0.45 per cent, or £45 on that £10,000 investment. And herein lies the problem. 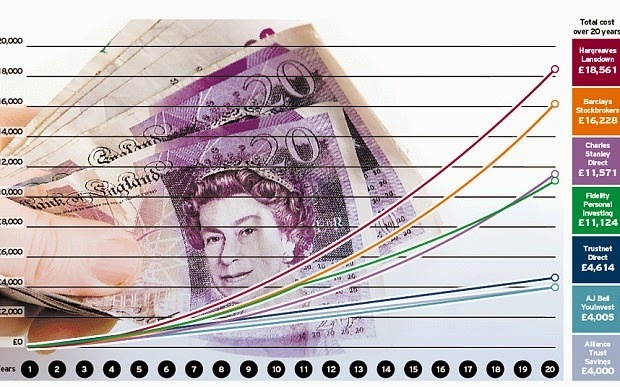 While it may not seem much at the start, the costs spiral, as the chart shows. Fidelity Personal Investing, a rival, has a similar approach, charging 0.35 per cent. A fresh wave of competitors charge in a different way. These companies apply a fixed fee regardless of what you hold. So as your money grows, the investment shop will not keep profiting from your investment success. Firms that charge this way include Alliance Trust Savings (ATS), iWeb and Interactive Investor. But there’s a caveat. Some of these companies charge to buy and sell funds. ATS, for example, will charge £12.50 each time. Paying a fixed yearly fee can also be relatively expensive for first-time investors in the early years. ATS, for example, will take £75 in the first year. But with Fidelity Personal Investing, the charge in year one would be just £35 on a £10,000 Isa – with no charge to buy the fund. A third way is an investment shop that charges a percentage fee, which is good for first-time investors who hold small amounts, but which caps the cost, which is good when thatIsa grows or you add more money. These include AJ Bell Youinvest, whose charge is 0.2 per cent capped at £200, and Trustnet Direct, 0.25 per cent capped at £200. These also tend to charge a dealing fee – around £10 – when you buy or sell a fund. “While some percentage-based companies may not seem to be that expensive after a few years, it makes a huge difference over the whole time you’re investing,” said John Blowers, head of Trustnet Direct. The figures, collated by Trustnet, show that over 20 years you would pay £18,561 to Hargreaves Lansdown or £16,228 to Barclays Stockbrokers, compared with £4,614 to Trustnet, £4,005 to Youinvest or £4,000 to ATS. The data is not perfect. If you buy and sell funds a lot, the costs wouldn’t change with Hargreaves – but they would be higher for Trustnet, ATS and Youinvest. And if you hold shares, the numbers change again. Hargreaves caps the charge on holding shares at £45, for example. There is also the issue of customer service. Hargreaves, the biggest investment shop with more than 600,000 investors, has a strong reputation, but its rivals are investing in their call centres and websites and are collecting awards. The bottom line is that if you only choose funds – a wise strategy that spreads your risk rather than you holding shares directly – and you intend to buy and hold, the chart above is essential. You might also consider comparefundplatforms.com for more detailed comparisons. What is meant by Investing?